U is for Ulna….err, Umbrella! 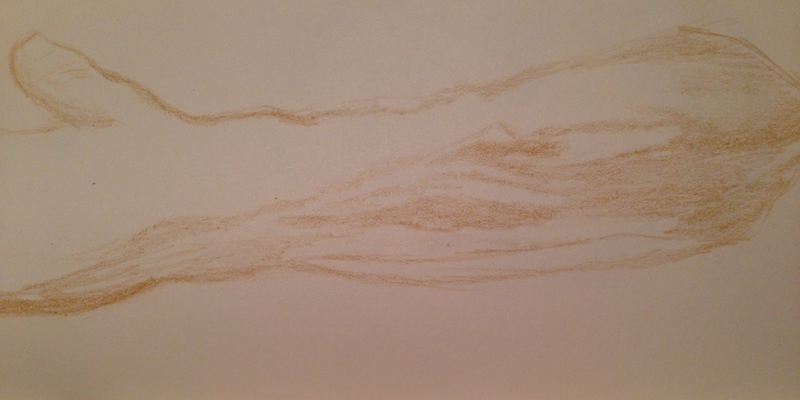 I was going to post a drawing of hub’s forearm….but it turned out looking like the forearm of someone from planet Krypton or something. Was it the lighting in the photo? Maybe that’s part of the reason I found this so difficult. I didn’t expect drawing an arm to be so hard, I have to say! Would you? I gave up before it was finished, because it had already been a long day, and I didn’t see much hope of (quickly) saving it! 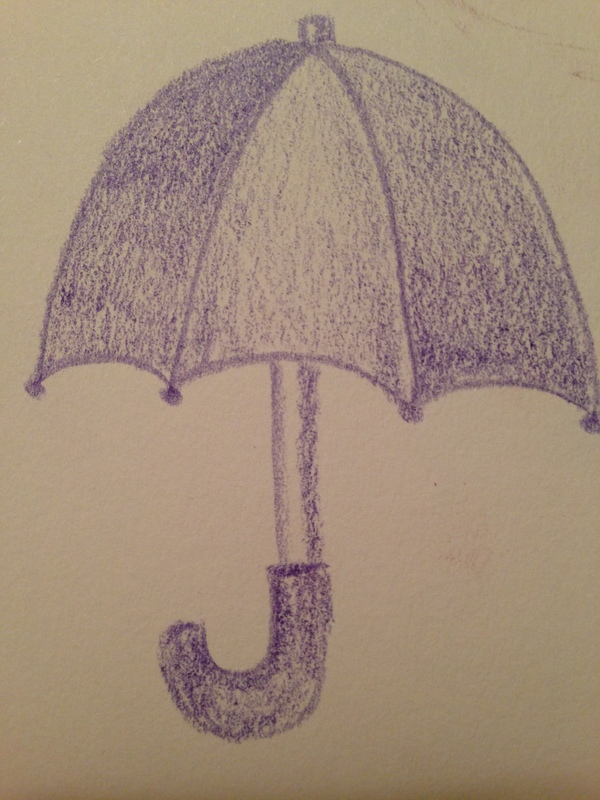 So I drew an umbrella instead. I know, yawn. And then I decided to post the original drawing and the photo reference anyway, just to see if anyone had any thoughts about it. Veins are hard to draw, I will say that much for sure! I love Thursdays. You gotta love the day before Friday. Right? Polar vortex and all. Looking forward to drawing something made out of wood for you tomorrow. See you then! I think you did a good job on the arm (the umbrella is nice too!). I think it´s quite hard, because the only difference here is light and shadow. No different colors, no angles and edges (talking about the veins and muscles). Maybe it´s also hard, because you do not see the rest of the body on the picture. Nobody would know that something is supposed to be a neck, if he does not see the chin and the shoulders to it, wouldn´t he? So I think that´s what made this hard – but anyway, I think you got it nicely! Thank you so much! Now I´m feeling better too 😊 Isn´t it nice to make people happy! It´s double joy! I like the umbrella and I like the arm. I find anatomy terribly challenging and I mostly get it wrong. But let’s keep at it because, well, there is an abundance of anatomy to draw. I too like the arm. We are our own worst critics it seems. You were doing ok with the arm, you just gave up too early. Remove the background shirt and look at the tonal range of just the arm. 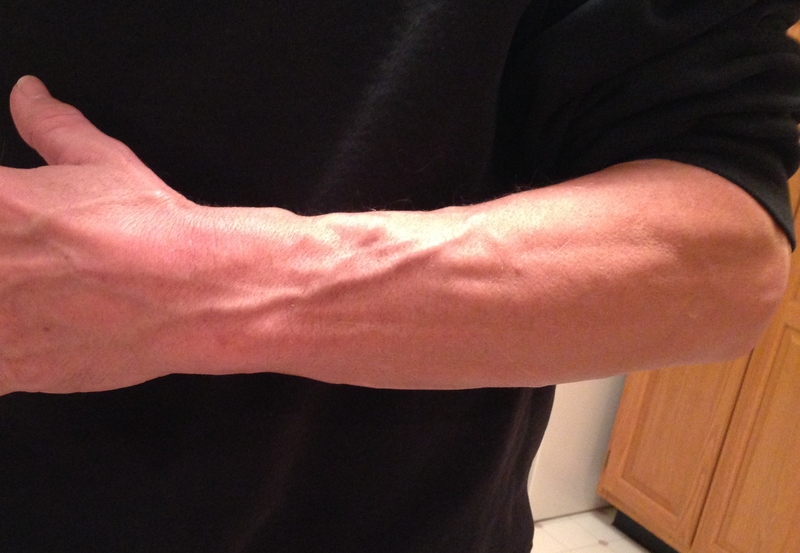 It goes from dark to light, so get some more of the shadows in and the veins and muscles will start to come out. Just go gently. What is possibly throwing you is the black shirt which restricts the tonal range in the arm.